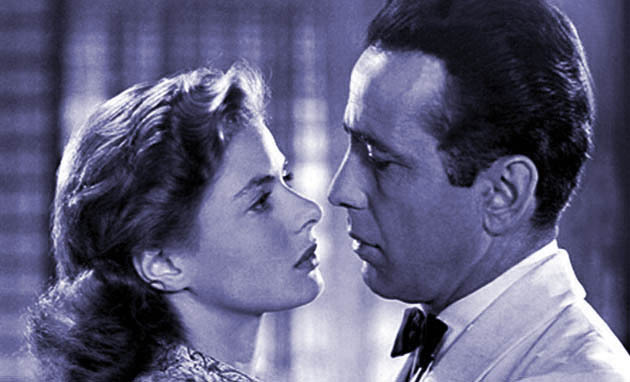 “Everybody Comes to Rick's” vs. Casablanca: A Warner Bros. release, the Michael Curtiz-directed 1942 movie classic stars Humphrey Bogart and Ingrid Bergman as war-crossed lovers; Murray Burnett's and Joan Alison's play remained unproduced when Warners' Hal B. Wallis acquired the film rights. Philip G. Epstein, Julius J. Epstein, and Howard Koch were credited for the play-to-screenplay adaptation; for their efforts, the trio won an Academy Award. Those interested in the film and its history might want to check out Martin N. Kriegl's brief 2004 essay “Casablanca: A Comparison between the Classic Motion Picture and Its Stage Play Source,” in which the author discusses the differences between the Burnett-Alison play and Philip G. Epstein, Julius J. Epstein, and Howard Koch's screenplay adaptation. In addition to winning the 1943 Best Picture Oscar, Casablanca – which actually opened in New York City the previous year – also brought Oscar statuettes to director Curtiz and its trio of screenwriters. Humphrey Bogart was nominated for Best Actor, but lost to Paul Lukas for another Warners release, Herman Shumlin's Watch on the Rhine. Best Supporting Actor nominee Claude Rains lost to Charles Coburn for George Stevens' comedy The More the Merrier. Ingrid Bergman was also shortlisted that year, but for Sam Wood's Spanish Civil War drama For Whom the Bell Tolls. She lost the Best Actress Oscar to fellow David O. Selznick contract star Jennifer Jones for The Song of Bernadette. Conrad Veidt. Peter Lorre. Dooley Wilson. Sydney Greenstreet. S.Z. Sakall. John Qualen. Curt Bois. Joy Page. Madeleine Lebeau. Leonid Kinskey. Alan Ladd and Veronica Lake in The Blue Dahlia. One of the many Hollywood duos featured in Leading Couples: The Most Unforgettable Screen Romances of the Studio Era, Paramount's Alan Ladd and Veronica Lake have been unfairly neglected by film historians, whose focus has invariably been on the better-remembered Humphrey Bogart and Lauren Bacall. With text by Frank Miller, whose previous books include Leading Ladies and Leading Men, introduction by Turner Classic Movies host Robert Osborne, and loads of photographs covering about half a century of Hollywood history, Leading Couples: The Most Unforgettable Screen Romances of the Studio Era (Chronicle Books, 2008) offers a glimpse into nearly 40 movie pairings from the so-called Golden Era (and a little later). Among those featured are the usual suspects: Fred Astaire and Ginger Rogers, Doris Day and Rock Hudson, Jeanette MacDonald and Nelson Eddy, Errol Flynn and Olivia de Havilland, Katharine Hepburn and Spencer Tracy, and Humphrey Bogart and Lauren Bacall. But to its credit, Leading Couples also includes more esoteric movie pairings – well, “esoteric” when looking at Hollywood's past from a 21st-century perspective. Examples include Marie Dressler and Wallace Beery, Janet Gaynor and Charles Farrell, Tyrone Power and Gene Tierney, Charles Boyer and Hedy Lamarr, and Betty Grable and Dan Dailey. Perhaps with the exception of Fay Wray and King Kong, my favorite film couple among those featured in the book are Alan Ladd and Veronica Lake, who were ideally cast in their four pairings in the 1940s. Ladd got his big break opposite the recently established Lake in Frank Tuttle's 1942 noir thriller This Gun for Hire, nominally starring Robert Preston. There would be three other costarring gigs for the Ladd & Lake duo: The Glass Key (1942), The Blue Dahlia (1946), and Saigon (1947). When not working with Veronica Lake, Alan Ladd was kept busy as one of Hollywood's top male stars of the 1940s, in dramas and thrillers such as And Now Tomorrow, Salty O'Rourke, Two Years Before the Mast, and O.S.S. His career peak, however, came out in 1953: as the title character in George Stevens' Western Shane, playing opposite Jean Arthur, Van Heflin, Brandon De Wilde, and Jack Palance. Veronica Lake's stardom all but ended along with the 1940s. When not smoldering her way into the heart of Alan Ladd's good-looking thugs, she was possibly at her best as a World War II nurse who uses her bosom – no kidding – to wipe out the evil Japanese in Mark Sandrich's So Proudly We Hail, costarring fellow Women at War Claudette Colbert and Paulette Goddard. Admittedly, Humphrey Bogart & Lauren Bacall had the advantage of being directed by higher-end filmmakers at Warner Bros.: Henry Hathaway (To Have and Have Not), Howard Hawks (The Big Sleep), Delmer Daves (Dark Passage), John Huston (Key Largo). 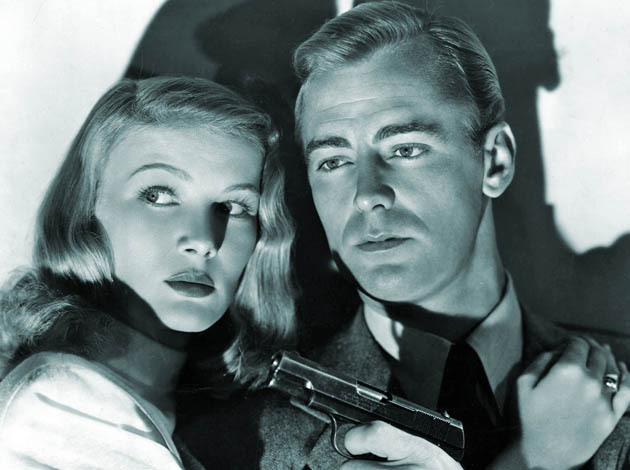 Alan Ladd & Veronica Lake had to make do with Frank Tuttle (This Gun for Hire), Stuart Heisler (The Glass Key), George Marshall (The Blue Dahlia), and Leslie Fenton (Saigon). Yet, as evidence of their combined talents, the smoldering chemistry between the two good-looking blonds – and their (however underrated) performances – unfailingly manage to enhance less-than-gripping screenplays and less-than-expert directorial hands. Ingrid Bergman and Humphrey Bogart Casablanca image: Warner Bros.
Alan Ladd and Veronica Lake The Blue Dahlia image: Paramount Pictures. “'Everybody Comes to Rick's' vs. Casablanca + Hollywood Leading Couples” last updated in December 2018. I'm teaching a program about adaptations next fall/winter. I'd love to include Everybody Comes to Rick's / Casablanca if I manage to get a copy of the play. Any chance of acquiring a copy of the play from you? you say you have a copy of the script for Everybody Comes To Rick's? Any chance a copy could be bought? I'd love to get a look. Been looking for a copy off and on for years. Would love to discuss this with you. His citations in the .PDF appear to be accurate in that they match to the pages in the script. However in this reader's opinion, they appear cherry-picked to prove a particular point — that the play is weak, and the movie is great. That's the official Warner Brothers' line, and one can hardly blame them for it, but… It seems cheap, somehow. This raises another point, perhaps minor — it's Rinaldo, not Renault, in the play. It's Luis, not Louis. There are other character name changes, as well. But the core of the story is much the same as the screenplay. Los Bros Epstein and Koch did far more of a light adaptation than a wholesale rewrite of Burnett and Alison, at least to this reader. Are you kidding me, the “couples”/ “actors” can't compare to the couples of yesteryear!